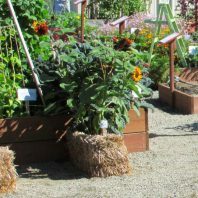 The Grays Harbor Master Gardener’s Demonstration Garden is located at the Grays Harbor Fairgrounds in Elma. 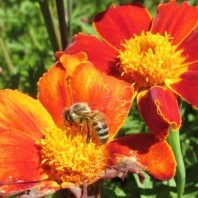 This national award winning garden has wonderful displays of vegetables and perennials. You will discover new ideas in container gardening, learn about composting, raised beds, drip irrigation and other gardening practices. These displays, created by the WSU Master Gardeners, change yearly and are always full of surprises. You will come away with new and exciting ideas for your own gardens. 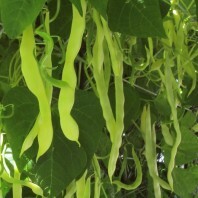 This year come see our bean tunnels, which help you save garden space while providing easy access to the growing string beans. Straw bales, currently used as planters for several tomato varieties, will help you save garden space while the warm decomposing bale can give you a boost for spring planting. Visit the garden during the Grays Harbor Fair. The garden is located next to the Floral & Home Arts Building/Pavilion Annex. It is staffed from 10:00 AM – 4:00 PM with WSU Master Gardener volunteers to answer your questions during the Grays Harbor County Fair. At other times you are welcome to tour around the garden.